Join Master Thrower Cameron Williams for your chance to develop your throwing ability beyond your current skill level. Refine your techniques and increase the scale of your forms while drawing on Cameron’s 30 years of experience as a production potter. To make sure that each participant receives plenty of support over the 4 days Cameron will be team teaching with a fellow thrower Neil from the South Coast of NSW. Cameron’s workshops suit beginner to advanced students, everyone can learn and improve their technique with guidance from such an experienced Potter. Read through the comments to gain an idea of how much the participants from previous years have enjoyed it below. 2019 will be Cameron’s 6th workshop at NBC. 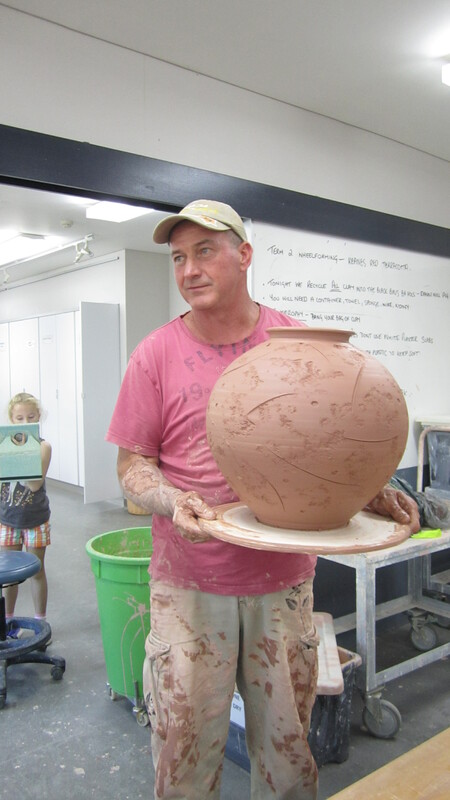 A huge “Thank you” to one of the busiest potters around for agreeing to host another 4 day summer school. 2019 Course Details- 4 days Monday-Thursday from 9:00am-4:00pm Cost- $420. Enrol via the TAFE NSW website here. Enrolment page please be sure to choose the master class commencing 29th of January. The 24th June offering is our winter school with Simone Fraser. What did the participants of the April 2014 workshop have to say? Here is a sample from the 15 people that attended. “Yes, Cameron is an amazingly intuitive thrower & Neil is a wonderfully patient guide (I don’t think I would have ended up with anything to keep if it hadn’t been for Neil’s help!). I really like Cameron’s 3-4 step processes for the making of the various types of objects. Was great to be able to video the demos. I was very much in two minds as to wether I should enrol in the workshop or not as I had never thrown a pot in my life!! But both Cameron and Neil were so encouraging and expert in their guidance I came on in leaps and bounds and enjoyed the whole experience immensely. Throwing (no pun intended!!) myself in at the deep end and enjoying everyone’s encouragement was a very memorable and positive experience. I’m already looking forward to the next workshop! Cameron and Neil’s workshop was very informative and hands on. It provided a systematic approach to creating different objects on the wheel (bowls, cylinders and plates), enabling you to achieve consistent basic forms, to which you could then add your own variations. It was great how both Cameron and Neil were committed to everyone in the workshop developing each of the techniques and took time to assist each student individually. What a wonderful week we had with Cameron Williams. It was an incredible privilege to receive instruction from such talented and giving ceramicists as Cameron and Neil. They were both so generous with their knowledge (and patience!). 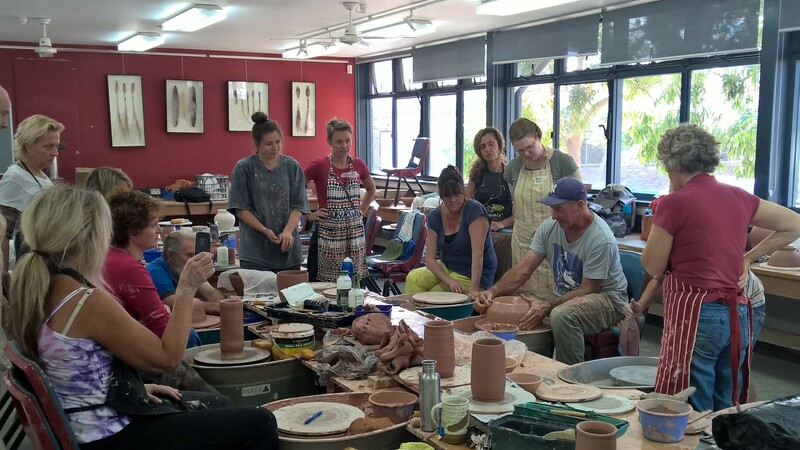 To be able to spend four consecutive days to totally immerse ourselves in clay was a great experience and even though at times we felt complete novices and were learning throwing all over again, our skills improved exponentially. Also a big thank you to Chris for organising the workshop and facilitating the opportunity to work with artists of such calibre.